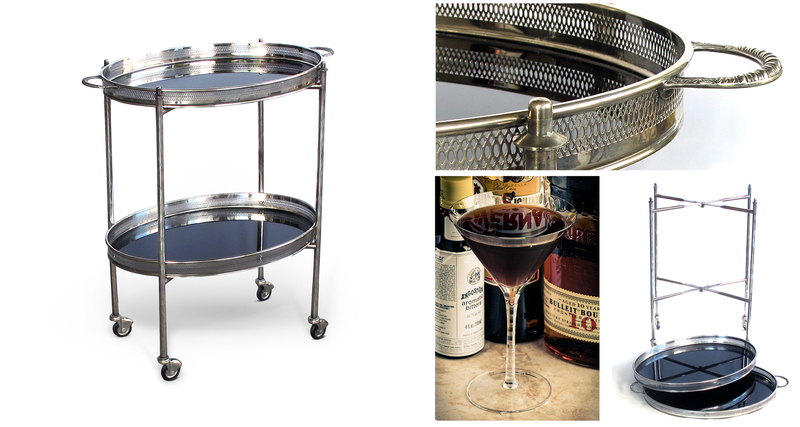 Classic & Chic Holiday: Black Manhattans w a Vintage Drinks Cart. When you’re in the mood for something dark with a touch of mystery this holiday, may we suggest, Black Manhattans served on MidCentury Nickel-Plated And Black Glass Drinks Cart; so classic, so chic! First, An Elegant French Mid-century Nickel-plated Oval-form Drinks/bar Cart With Black Glass Trays 1950's. The collapsible nickel-plated frame fitted with 2 removable black glass trays with reticulated gallery; excellent condition with minor overall wear height: 27 1/2" width: 24 3/4" depth: 14 1/2"
Our all-black-themed affair has to have the perfect moody drink: The Black Manhattan! This version of the Manhattan was created by San Francisco bartender,Todd Smith, during his time at Bourbon & Branch. The original recipe called for bourbon, but this cocktail contains rye whiskey and dashes of two different bitters. Like a classic film noir femme fatale, this cocktail adds allure and mystique. Stir all ingredients with ice until cold. Strain into a well-chilled cocktail stem. Nickel-plated Oval-form Drinks/bar Cart With Black Glass Trays 1950's.